NEW YORK — A year after missing out on the playoffs by just one game, Denver wouldn't mind snatching the top spot in the Western Conference from defending champion Golden State. At the same time, the Nuggets don't think it's the most important thing for a deep post-season run. Veteran forward Paul Millsap is not too worried about the No. 1 seed. His preference is a more a consistent effort on defence like he saw each time the Knicks tried to battle back before Denver answered. "As a young team and as a team period, you got to find different ways to win. Your shot's not going to always fall. You're not always going to play great defence. But at the end of the say it's about winning games." 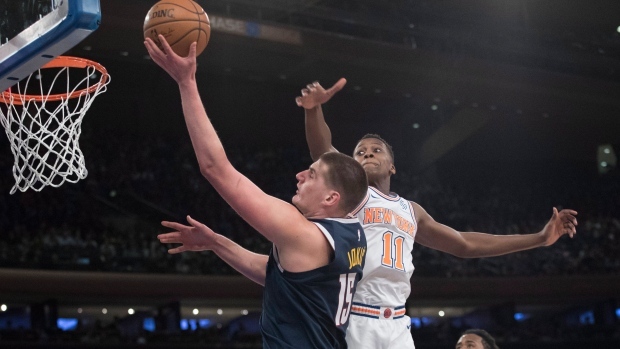 But that was closest the Knicks would get the rest of the night as their offence sputtered the rest of the period, shooting just 1-for-8 from the field.